The nanoAVR HD is a high-resolution 8-channel audio processor combined with a 2-input HDMI audio and video switch. The floating-point SHARC digital signal processor (DSP) at its core provides an unmatched level of tuning flexibility for eight channels of uncompressed high-resolution (24-bit, 96 kHz) digital audio. Channel routing and mixing, bass management, independent crossovers, 10 bands of parametric EQ on every channel, time alignment... this palm-sized processor is a little powerhouse of audio processing for your home theater. Last but not least, our free Android and iOS App provide live control of basic settings such as volume/mute/presets. An all in one control remote from your tablet/phone! # For nanoAVR HD plugin/UI. Please see User Manual for full details. Looking for an HDMI to analog out solution? Check out the nanoAVR HDA. 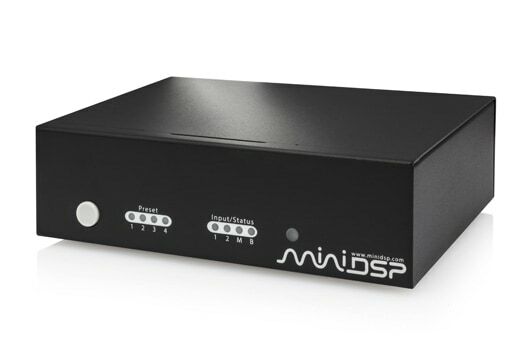 In this app note we will show you how to equalize all channels of your home theater system using the miniDSP nanoAVR. Before starting on this app note, you will need to connect the nanoAVR into your system and ensure that it is working correctly. To do so, please read through the User Manual. that your player/source can be set to provide multichannel audio as linear PCM.